The R-PLEX Human Troponin T (cardiac) Antibody Set includes a matched capture and detection antibody pair and calibrator for the quick and easy measurement of Troponin T (cardiac) in biological samples. R-PLEX products leverage MSD’s electrochemiluminescence technology for better sensitivity and a larger dynamic range than traditional ELISAs. R-PLEX matched antibody sets enable the development of singleplex and multiplex immunoassays. Individual assays may be developed using MSD avidin- or streptavidin-coated plates. Custom multiplex assays with any combination of R-PLEX analytes, as well as R-PLEX plus U-PLEX analytes, can be developed on U-PLEX MULTI-SPOT plates. To learn more about the advantages of R-PLEX products click here. 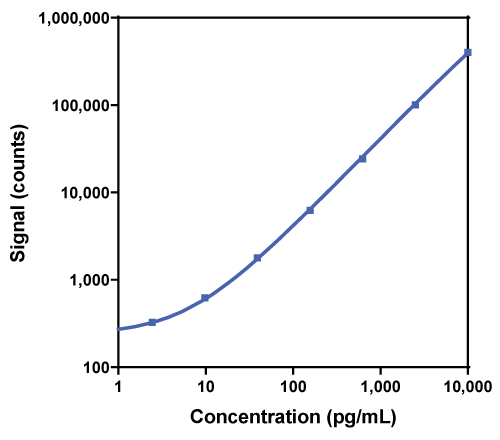 Calibration curve for the R-PLEX Human Troponin T (cardiac) Antibody Set was assessed and representative data are presented below. Description - Cardiac Troponin T (TNNT2, TnTC, cTnT) is one protein of a heterotrimer that regulates muscle contraction. Troponin acts with intracellular calcium to control the interaction of actin and myosin filaments in striated muscle fibers. When muscle tissue is damaged, the troponin-tropomyosin complex breaks down and troponin I and troponin T are released into the blood. Troponins are excellent biomarkers for myocardial injury in cardiotoxicity due to their tissue specificity, thus this antibody set is a useful tool in cardiovascular disease research. No increases in biomarkers of genetic damage or pathological changes in heart and brain tissues in male rats administered methylphenidate hydrochloride (Ritalin) for 28 days. Veterinary and toxicological applications for the detection of cardiac injury using cardiac troponin.